Who are Pell Grant Recipients? Finding 1: The majority of four-year colleges do not serve Pell students well. Finding 2: A majority of four-year institutions have a graduation gap between their Pell and Non-Pell student populations. Finding 3: Many students have spotty access to high-performing Pell-Serving Institutions. Since 1972, the Pell Grant has served as the primary tool for increasing access to higher education for low- and moderate-income students.1 That’s why the federal government continues to spend nearly $30 billion dollars on this important program each year.2 But despite this large taxpayer investment, there has been almost no publicly available information on how well institutions serve Pell students. This is in large part because the Department of Education (Department) has not previously required institutions to report the outcomes for this critical student population. In 2015, The Education Trust gave us our first glimpse at graduation rates of Pell students and the gap between Pell and non-Pell students at four-year institutions.3 They went through the lengthy and labor-intensive project of collecting graduation rate data for institutions—ultimately covering over three-quarters of public and nonprofit bachelor’s degree-granting institutions. Their research found 51% of Pell Grant recipients at these institutions graduated, as compared to 65% of non-Pell students. But in October 2017, a change in reporting requirements made the graduation rates of first-time, full-time Pell recipients publicly available from the federal government for the first time, giving both taxpayers and students their first comprehensive look at how well institutions are doing at helping this critical population secure the degrees they need to ultimately access well-paying jobs and succeed in our 21st century economy.4 We already have a college completion crisis, where at the average four-year institution, only a little over half of students earn a degree.5 This new data uncovers an additional layer of this crisis for low- and moderate-income students. As colleges continue to bill themselves as mobility machines for students, this new data lets us hone in on how well institutions are serving Pell students, who need the economic security of a college degree the most.6 In this analysis, we examine the graduation rates of first-time, full-time Pell students at four-year institutions, with a special focus on institutions that serve a high percentage of Pell students. We also examine the graduation rate gaps that exist between first-time, full-time Pell and non-Pell populations at all four-year institutions in this sample. New Pell data uncovers an additional layer of the college completion crisis for low- and moderate-income students. 1. A majority of four-year institutions fail to serve their Pell students well. After six years, only 49% of first-time, full-time Pell recipients earned a bachelor’s degree at the institution where they started. 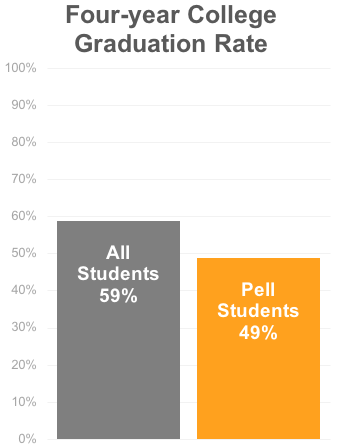 Only 47% of institutions graduated half or more of the Pell students who initially enrolled. 214 institutions have Pell graduation rates lower than 25%. Of the more than 60,000 Pell students initially enrolled at these institutions combined, only 9,904 of them (16%) graduated within six years. 2. For many institutions, there is a gap between how well they serve their Pell and non-Pell students. Nationally, Pell students graduate at a rate of 18 percentage points less than their non-Pell peers. 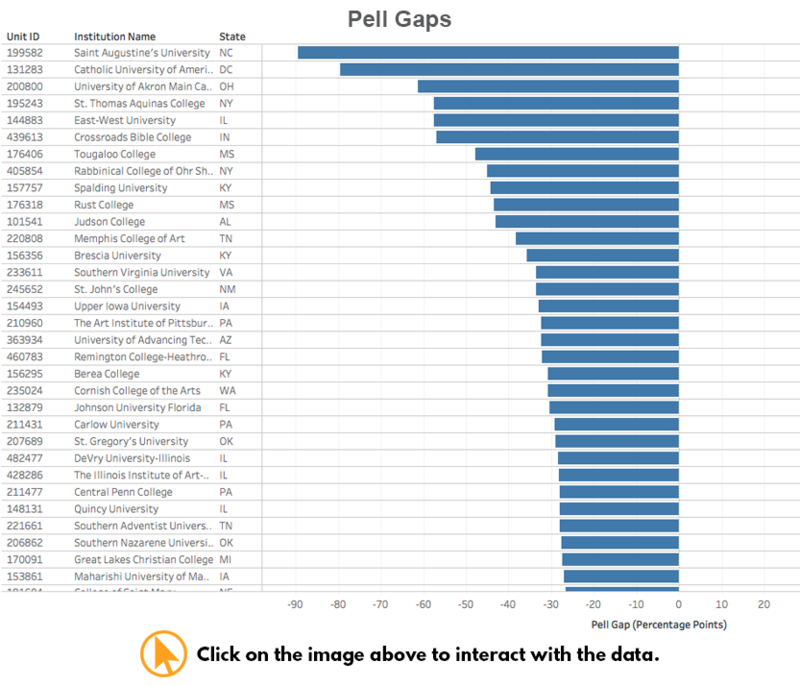 The average institutional Pell Gap is 7 percentage points, with 1,245 out of 1,566 institutions (80%) graduating Pell students at a lower rate than their non-Pell peers. Of the institutions who graduate Pell students at a lower rate, 573 institutions have gaps greater than 10 percentage points—97 of which have gaps larger than 20 percentage points. Yet it is not impossible to serve Pell students well, as 242 of 1,566 institutions have higher graduation rates for their Pell students than their non-Pell students. 3. Many students have spotty access to high-performing Pell-Serving Institutions (PSIs). 965 of 1,566 four-year institutions serve an above average (37% or more) percentage of Pell students. We call these institutions “Pell-Serving Institutions” (PSIs) throughout our analysis. Only 246 of these Pell-Serving Institutions (25%) have Pell graduation rates at or above 50%. Seven states have no PSIs with Pell graduation rates greater than 50%. Only 48 PSIs graduate two-thirds or more of their Pell students. Given the diversity of the Pell student population, it is clear that there are barriers outside the higher education system that make the road to college completion more difficult for many of these low- and moderate-income students. However, these factors do not negate the responsibility institutions have to help their Pell students succeed. And while many schools are fulfilling that responsibility and getting good outcomes, too many are leaving most of their Pell students degreeless, even after 6 years. For this analysis, we used the new graduation rate data released through the Department’s Integrated Postsecondary Education Data System (IPEDS) database in October 2017.12 This first round of publicly-available data on Pell student graduation rates only included first-time, full-time students and does not cover transfer or part-time Pell students. Our analysis only looks at four-year, bachelor-degree granting institutions because they serve a higher percentage of first-time, full-time students. In fall of 2018, the Department plans to release graduation rates for part-time and transfer Pell students as well, allowing us to get a better picture and expand this analysis to the two-year and certificate-granting institutions. With this currently available data, we calculated the Pell graduation rate by finding the percent of the 2010 cohort of first-time, full-time bachelor’s degree seeking Pell Grant recipients who had graduated six years later.13 Because we had both the number of all students and Pell students in the cohort who started and graduated, we also calculated two other data points for the analysis: the “Pell share” and the “non-Pell graduation rate.” The “Pell share” is the percentage of students in the first-time, full-time cohort who received Pell Grants (as opposed to the percent of all undergraduates receiving Pell Grants, as previously reported in IPEDS). The “non-Pell graduation rate” was calculated by removing the Pell students from the overall cohort in order to isolate how institutions serve both their Pell and non-Pell students. We know that Pell students face unique challenges, but that doesn’t mean institutions are unable to help them succeed. Like any other college-goer, Pell students enroll in higher education in the hopes that it will improve social mobility and economic opportunity. But our analysis finds that the overall graduation rate for Pell students who enroll in a four-year college is a meager 49%—ten points lower than the overall student graduation rate for students in this same cohort.15 As a result, low- and moderate-income students starting college for the first time currently have no better than a 50:50 shot of actually earning their degrees within six years of enrollment. At for-profit institutions, only one-in-five first-time, full-time Pell students graduate within six years. 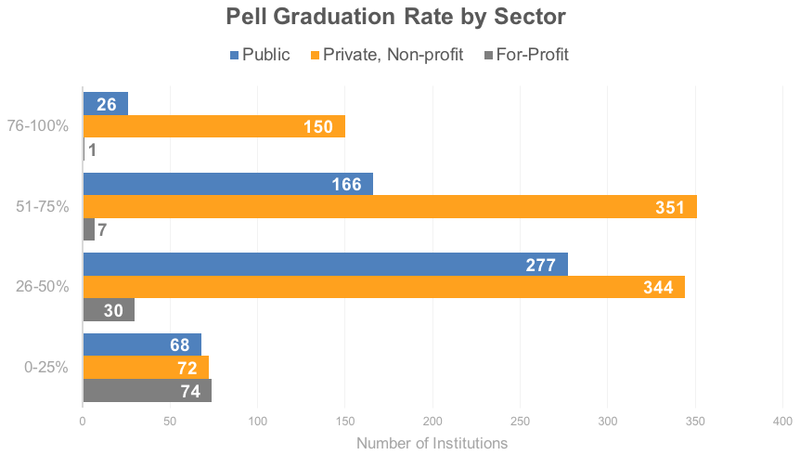 When breaking down Pell graduation rates across sectors, we see that this middling outcome exists at public, for-profit, and private, non-profit institutions. The problem is particularly acute for Pell students attending for-profit colleges (even though those schools serve a much smaller raw number of Pell students). At for-profit institutions, only one-in-five first-time, full-time Pell students graduate within six years—nearly 30 percentage points below the national average of all four-year institutions. These staggeringly low graduation rates become even more problematic when looking at the share of Pell students within each sector. For example, there is a much greater concentration of Pell students in the for-profit sector, accounting for 64% of their first-time, full-time students—a disconcerting number given their track record in serving this population miserably. Graduation rates by institution are just as problematic. When looking at the Pell graduation rates at the institution level, we also find that over half of four-year institutions leave a majority of their Pell students degreeless six years after enrollment. At the 1,566 four-year institutions included in the analysis, only 47% graduated half or more of the Pell students in their cohort from that institution.16 Comparatively, 65% of these same institutions graduate over half of their non-Pell population—meaning that institutions are systematically failing the subgroup of students who need the economic benefits of a college degree the most. Only 8 out of 112 for-profit institutions graduate more than half of their first-time, full-time Pell students. And an astounding 214 institutions (74 for-profits, 72 private, non-profits, and 68 publics) have Pell graduation rates equal to or lower than 25%. There is a relationship between the proportion of Pell students an institution serves and its Pell graduation rate. When looking at the Pell graduation rates of all four-year institutions, it becomes clear that there is a strong correlation between an institution’s Pell graduation rate and the share of the cohort receiving Pell Grants. The interactive chart below shows this relationship and it’s clear many schools with a high proportion of Pell students struggle to get good outcomes for them. 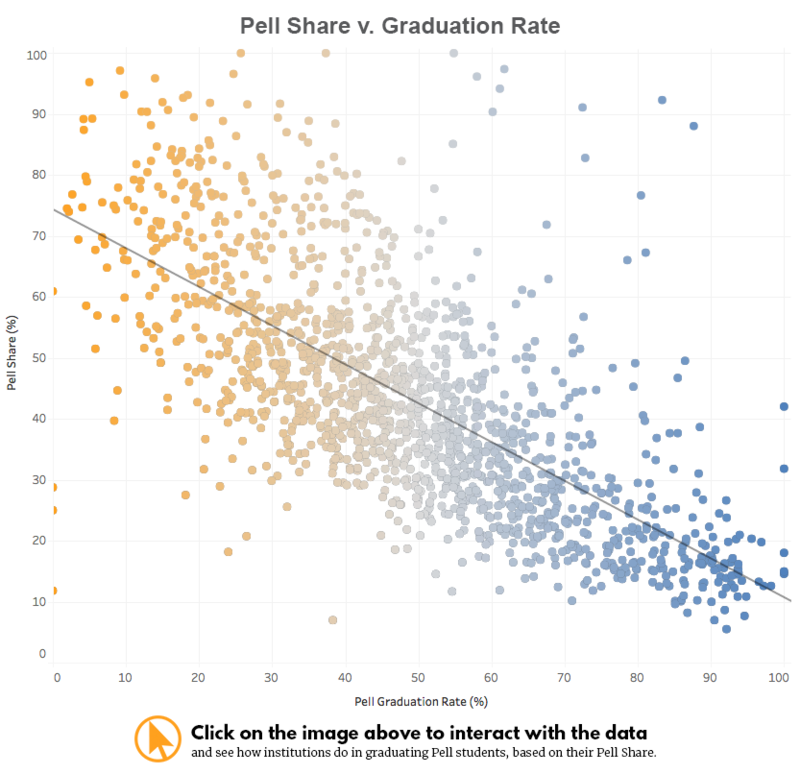 However, correlation is not causation and demographics are not necessarily destiny, as some institutions perform above what their expected graduation rate might be based on their share of Pell students. A good number of them buck the trend, graduating their Pell students at a higher-than-average rate and outperforming expectations. For example, Berea College and Baruch College both have a Pell share greater than 50% and graduation rates greater than 60%. But still, when you dig into the data, schools with similar shares of Pell students are showing wildly differing results. For example, the University of North Carolina at Pembroke and California State University-Stanislaus have an equal share of their first-time, full-time cohort receiving Pell at 58%, and they even have similar raw numbers of Pell students, but these schools achieve very different outcomes for them. UNC-Pembroke only graduated 33% of their first-time, full-time Pell students, while CSU-Stanislaus graduated 57% of theirs. As this chart indicates, it’s clear that some institutions are meeting or exceeding their expectations. Conversely, there are also a significant number of four-year colleges that are underperforming, including those that graduate fewer than half of their Pell student population. This is especially true at low-performing institutions that serve a large Pell student population, where schools are ultimately leaving tens of thousands of low- and moderate-income students without a degree. For example, 60,305 Pell students started at the 214 institutions with Pell graduation rates at or below 25%. Just 9,904 (16%) of these same students had graduated six years later. And while we’ve seen some of the worst actors concentrated in for-profit colleges, this completion problem is evident across four-year institutions in all sectors. While there are significant problems when you look at the overall Pell student graduation rates across sectors, the failure of the status quo in our higher education system becomes even more evident when you examine the graduation gaps that exist between Pell and non-Pell students across and within institutions. Similar to the gaps reported by The Education Trust and Seton Hall professor Robert Kelchen, when comparing outcomes for Pell and non-Pell students, our analysis finds that overall, Pell students graduate at a rate of 18 percentage points less than their non-Pell peers.17 Across sectors, the gap between Pell and non-Pell students is similar, revealing a troubling pattern that illustrates this is a systemic problem across the entire higher education system. These kinds of widespread gaps in completion create greater disparities between low- and moderate-income students and their wealthier peers, betraying the promise that college is supposed to be a mobility engine for all. Of the 1,566 four-year institutions analyzed, 1,273 (or 81%) have a gap between their Pell and non-Pell graduation rates. For example, the University of Akron’s graduation rate for non-Pell students is 61 percentage points higher than for their Pell-receiving peers. Of course, some of these institutions have smaller, less abysmal gaps, but 573 institutions (45%) have gaps greater than 10 percentage points. And 96 of those institutions have gaps greater than 20 percentage points. However, it should be noted that there are 242 four-year institutions that actually have higher Pell graduation rates than non-Pell graduation rates, meaning those institutions are doing a better job at graduating their Pell students than their non-Pell peers. This shows that it is possible for institutions to serve their lower-income students just as well as, if not better than, the rest of their student body. For example, Howard University, a historically black college with a Pell share of 45%, has a Pell graduation rate of 79%, which is 33 percentage points higher than their non-Pell graduation rate. There is wide variation in the number and percentage of Pell students that different institutions serve, with some four-year schools enrolling a drastically higher proportion of Pell students than others. We commend these institutions for providing greater access to the low- and moderate-income students who rely on college for economic mobility the most. However, the data reveals that too often Pell students are concentrated within institutions where far too few students get to graduation day. Pell-Serving Institutions have graduation rates below the national average. In order to better understand how well Pell students are faring at institutions with a high proportion of Pell recipients, we looked at the 965 institutions that serve an above-average (37% or higher) share of Pell Grant students in their first-time, full-time cohort and label these institutions as “Pell-Serving Institutions” (PSIs). When looking at the graduation rates of PSIs, we find that on average, PSIs have an institutional graduation rate that is 10 percentage points lower than the overall institutional Pell graduation rate at four-year institutions—with a mere 39% of first-time, full-time students having graduating six years later. Part of this discrepancy is a result of some non-PSIs taking in a very small proportion of Pell students, including 147 where less than 1 in 5 of their students receive Pell Grants. Pell-Serving Institutions have an institutional graduation rate of 39% for their first-time, full-time students. But demography isn’t destiny, as some Pell-Serving Institutions do well at getting Pell students to graduation. Some institutions are beating the odds to close Pell graduation rate gaps, showing that it is possible to help Pell students achieve the same outcomes as their non-Pell recipient peers. For the purposes of this analysis, we define “high-quality PSIs” as those institutions that have an above-average share of Pell students and graduate Pell students at a rate of 50% or greater. For example, there are 48 PSIs that graduate two-thirds or more of their Pell students, such as the University of California-Riverside. Though 57% of their first-time, full-time students received Pell Grants, the university has a Pell graduation rate of 73%, far above the national average. Grace University in Nebraska is an example of a small, private, non-profit institution doing better than average with Pell students, boasting an above-average graduation rate of 55% even though 100% of their first-time, full-time cohort are Pell recipients. Monroe College, a for-profit institution in New York, also bucks the trend, with 73% of its Pell Grant recipients graduating last year. This shows that it is possible to find success with a large share of Pell students, across sectors and in small, medium, and large institutions with cohorts ranging from 31 to over 2,000 Pell students. And while selectivity and academic preparedness of the students attending these schools undoubtedly plays a role in some of these impressive outcomes, it is clear that these institutions are committed to admitting an above-average share of Pell students and equally committed to helping them succeed. The table below highlights the top PSIs by sector. It should be noted that while the top public and private, non-profit graduation rates look very similar, the same cannot be said for the for-profit sector, as only five of the for-profit institutions in this analysis even met that minimum bar of having graduation rates of 50% or greater. 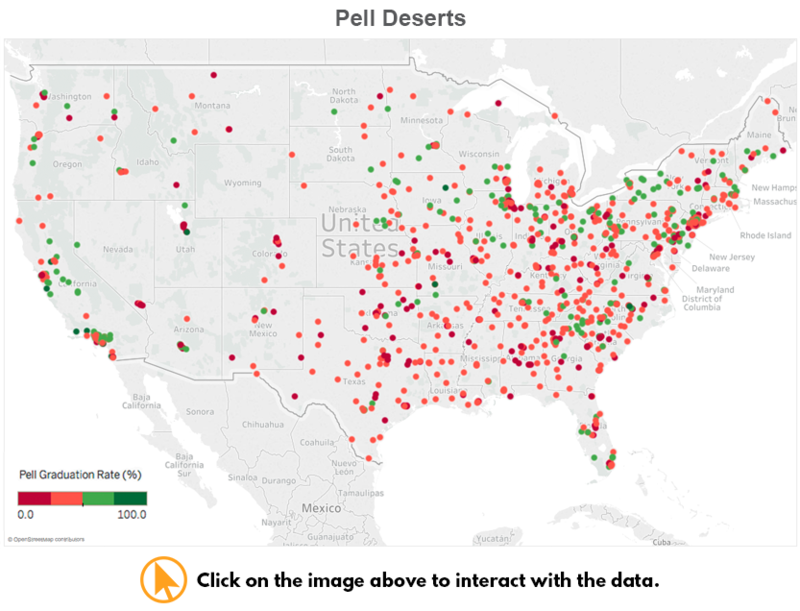 Many students live in “Pell deserts” where they face limited access to schools that would provide them with true opportunity. When mapping schools across the country, we find a large number of students live in geographic areas where there are zero high-quality PSIs. Specifically, seven states have no PSIs with graduation rates greater than 50%: Louisiana, Alabama, Colorado, Wyoming, New Hampshire, Rhode Island, and Connecticut. Even in some densely populated areas, there are few options for students to find a high-quality school that admits an above average rate of Pell students. For example, Texas only has four PSIs with a greater than 50% graduation rate. Yet students who live in California have much better access, with 37 PSIs showing Pell graduation rates at 50% or higher. 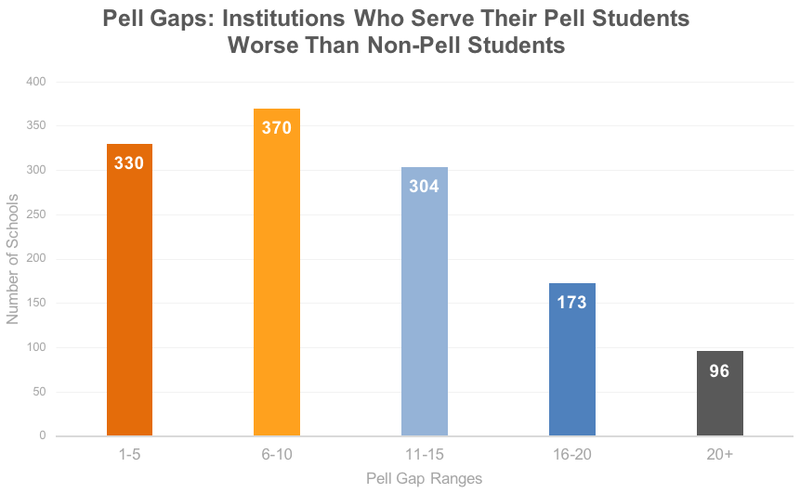 Support for High-Quality PSIs and Schools with Low Pell Gaps: Congress should create a new designation for institutions that enroll higher percentages of Pell students and serve them well as “Pell-Serving Institutions.” These institutions could then be targeted for additional resources and support to improve the outcomes of those Pell students. Additionally, Congress should implement incentives to reduce Pell gaps at colleges and universities to reward institutions that have demonstrated their commitment to ensuring equity for low- and moderate-income students. And as part of incentivizing schools to close gaps, Congress could also require that the overall graduation rate does not decrease (otherwise simply doing worse with students overall could close the gap). Skin-in-the-Game: There’s a growing conversation about “risk-sharing” in higher education, but a majority of proposals on the table today only consider the risk associated with loans. However, it’s clear that Pell students bear risk too, especially when they use up their Pell eligibility to attend low-performing schools. In addition, the federal government invests nearly $30 billion in tax dollars to support the Pell Grant program each year. To ensure that institutions spend this taxpayer investment wisely, schools should be required to pay back some fraction of the Pell Grants they receive if they fail to get good outcomes for their Pell Grant students. This kind of system could provide bonuses to institutions admitting and/or graduating an above-average proportion of Pell students in order to ensure that schools continue to take in low- and moderate-income students. We already know we have a completion crisis in higher education—and this new data shows us that this problem is even more acute for low-and moderate-income students. This first unearthing of Pell graduation rates is an important step toward providing Pell recipients with the information they need to know how well institutions serve students like them. But until Congress puts in place additional accountability measures, institutions with abysmal Pell graduation rates and yawning gaps will continue to receive massive taxpayer investment with no incentive to improve. We know that it is possible to succeed with Pell students, which is why our policies must find ways to reward and scale up programs that have proven results with this population. We know that a college degree is a worthwhile investment and a ticket to economic mobility. But this investment will only pay off if we make sure that students who receive Pell dollars attend institutions that prioritize their success and get them to graduation. Andrew Nichols, “The Pell Partnership: Ensuring a Shared Responsibility for Low-Income Student Success,” Published on September 24, 2015, Accessed on January 24, 2018. Available at: https://edtrust.org/resource/pellgradrates/; See also Robert Kelchen, “A look at Pell Grant recipients’ graduation rates,” Brookings Institute, Published on October 25, 2017, Accessed on May 1, 2018. Available at https://www.brookings.edu/blog/brown-center-chalkboard/2017/10/25/a-look-at-pell-grant-recipients-graduation-rates/. “Trends in Student Aid,” report, The College Board, 2017, p. 24. Accessed December 13, 2017. Available at: https://trends.collegeboard.org/student-aid. Andrew Nichols, “The Pell Partnership: Ensuring a Shared Responsibility for Low-Income Student Success,” Published on September 24, 2015, Accessed on January 24, 2018. Available at: https://edtrust.org/resource/pellgradrates/. United States, U.S. Department of Education, National Center for Education Statistics, “IPEDS Survey Data,” Accessed on December 8, 2017, Available at: https://nces.ed.gov/ipeds/Home/UseTheData. Michael Itzkowitz, “New Data Further Cements Completion Crisis in Higher Education,” Third Way, Published on February 1, 2018, Accessed on February 8, 2018. Available at: http://www.thirdway.org/memo/new-data-further-cements-completion-crisis-in-higher-education. Specialty institutions such as those with only healthcare, theological, or religious programs were excluded from this part of the analysis. Those institutions are included in the overall numbers. United States, Department of Education, “Federal Pell Grant Program Annual Data Reports,” Accessed on March 2, 2018. Available at: https://www2.ed.gov/finaid/prof/resources/data/pell-data.html, Based on 2015-2016 data. United States, Department of Education, “Federal Pell Grant Program Annual Data Reports,” Accessed on March 2, 2018. Available at: https://www2.ed.gov/finaid/prof/resources/data/pell-data.html. ; See also: United States, Department of Education, National Center for Educational Statistics, “Trends in Pell Grant Receipt and the Characteristics of Pell Grant Recipients: Selected Years, 1999-2000 to 2011-12,” September 9, 2015. Accessed on March 2, 2018. Available at: https://nces.ed.gov/pubsearch/pubsinfo.asp?pubid=2015601. United States, U.S. Department of Education, National Center for Education Statistics, “IPEDS Survey Data,” Accessed on November 8, 2017, Available at: https://nces.ed.gov/ipeds/Home/UseTheData. For this paper, graduation rates and Pell Gaps have been rounded to the nearest whole number, but in the downloadable data file and in Tableau the data is only rounded to the nearest tenth. We kept schools that had a zero graduation rate in this analysis even though we realize this could be due to an error in reporting. However, we are not in the position to make that call because there could be other errors in reporting that remain in the data. United States, U.S. Department of Education, National Center for Education Statistics, “Fast Facts: Graduation Rates,” Accessed on November 8, 2017, Available at: https://nces.ed.gov/fastfacts/display.asp?id=40. In federal graduation rates, transfer students are counted as non-graduates. Their success at other institutions is unknown to the public due to the federal ban on student level data. It is important to note the gap does not take the Pell share into account. So, a school may have few non-Pell students but have a significant gap because their enrollment may be mostly Pell—and vice versa. Nicholas Hillman and Taylor Weichman, “Education Deserts: The Continued Significance of “Place” in the Twenty-First Century,” Published in 2016, Accessed on January 17, 2018. Available at: http://www.acenet.edu/news-room/Pages/CPRS-Viewpoints-Education-Deserts.aspx. Renya Gobel, “More People Eligible for Pell Grants than Expected,” Forbes, January 31, 2015. Accessed on March 3, 2019. Available at: https://www.forbes.com/sites/reynagobel/2015/01/31/more-people-eligible-for-pell-grants-than-expected/#495acad21290; See also: United States, U.S. Department of Commerce, U.S. Census Bureau, “Income and Poverty in the United States: 2016,” Accessed on March 21, 2018, Available at: https://www.census.gov/data/tables/2017/demo/income-poverty/p60-259.html. United States, Congress, Senate, “S.2201 – Access, Success, and Persistence in Reshaping Education Act of 2017,” 115th Congress, 1st Session, December 06, 2017. Accessed on January 18, 2018. Available at: https://www.congress.gov/bill/115th-congress/senate-bill/2201/text.